We report four cases of high-grade astrocytoma with a BRAF V600E mutation, ATRX inactivation, and CDKN2A/B homozygous deletion. Children to young adults aged 3–46 presented with a well demarcated contrast-enhancing mass in the supratentorial area. Pathological examination revealed packed growth of short spindle to round polygonal cells including some pleomorphic cells. The tumors had less ability to infiltrate into the adjacent brain parenchyma and presented a circumscribed growth pattern. Mitosis was readily found, accompanied by focal necrosis and/or microvascular proliferation. Tumors were histologically similar in part to pleomorphic xanthoastrocytoma (PXA) or anaplastic PXA, but did not fit criteria for either neoplasm. 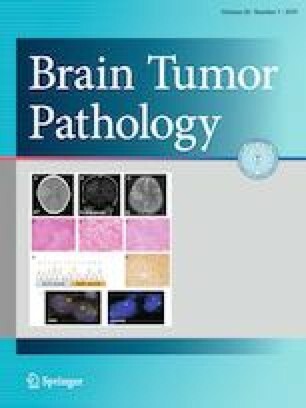 A BRAF V600E mutation and homozygous deletion of CDKN2A/B were observed, which is similar to the genetic features of PXA or epithelioid glioblastoma, but the additional loss of ATRX nuclear immunoreactivity and absence of TERT promoter mutation were unusual findings, indicating a novel genetic profile. Despite their malignant histological features, all patients had a favorable clinical course and remained alive for 6 months to 28 years under standard medical treatment for malignant glioma. In summary, high grade astrocytomas with BRAF V600E, ATRX, and CDKN2A/B alternations had unique clinicopathological features and may be a novel subset of high grade glioma. The online version of this article ( https://doi.org/10.1007/s10014-019-00344-z) contains supplementary material, which is available to authorized users. We thank Ms. Machiko Yokota (Gunma University) for her excellent technical assistance.